Electric Engraver with dial stroke adjustment, ideal for decorative engraving or adding security by personalizing your valuables, 7,200 SPD, 115V motor, engraves on metal, plastic, glass, ceramics, wood & even leather, corded. Engrave, decorate, or personalize a wide variety of materials--from metal to plastic to wood and leather--with the Dremel 290-01 7,200 Stroke Per Minute Engraver. This handy tool includes a letter and number template for infinite artistic possibilities. 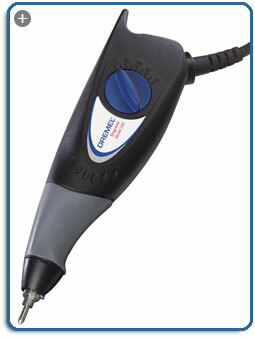 It also features a soft-grip body, replaceable carbide engraving point, and variable stroke control. 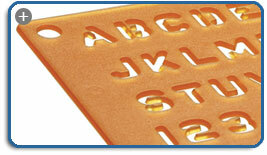 The included letter and number template makes it easy to personalize your items.View larger. With a five-position stroke adjustment, the engraver etches fine lines and deep grooves.View larger. 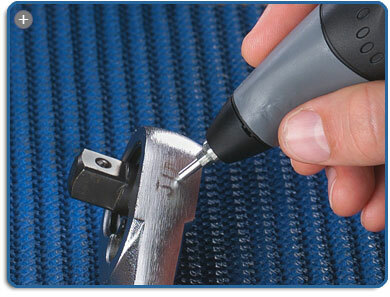 The included 9924 carbide engraving point ensures precise results.View larger. Powered by a 7,200 SPM, 115-volt motor for reliable performance, the 290-01 lets you personalize your valuables or decorate metal, glass, and stone for a unique touch. It's also perfect for ceramics, crafts, and jewelry making. With the 290-01, the only limit is your imagination. Engrave your wedding date on a glass tumbler for a special anniversary gift or wedding favor, jazz up a plain wooden frame with a mix of lines and letters, or embellish a simple mirror with a lovely engraved design. With this tool you can also mark your valuables to help protect them from theft and engrave your name directly on your luggage to make it easier to spot your bag at the airport. The Dremel Engraver helps you identify and protect property like tools, bikes, cameras, TVs, and other valuables quickly and easily. Engraving your valuables with your name or identification number makes them less likely to be stolen, as personalized items are more difficult for would-be thieves to sell for a quick profit. Plus, should your property become lost or stolen, having identification on the item helps police return recovered items to you more quickly. Featuring a five-position calibrated stroke adjustment dial to regulate the engraving depth, the 290-01 lets you etch fine lines or deep grooves in metal, glass, wood, leather, plastic, and ceramic. Its soft-grip body ensures a comfortable, secure grip, while a replaceable carbide engraving point ensures precise results. For added versatility, you can also purchase an optional 9929 diamond point (not included) for heavy-duty use on hard surfaces. Weighing just 12 ounces, the 290-01 has a light and compact design that lets you perform intricate work without excessive stress on your wrist or hand, and the included number and letter template helps you complete your engraving quickly and easily without mistakes. For additional peace of mind, the 290-01 comes with a two-year warranty. 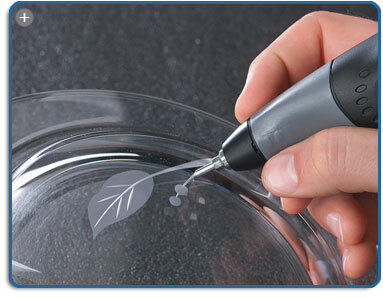 The versatile, easy-grip 290-01 lets you decorate and label a wide range of material, from tough metal to delicate glass.